Install "solar-control" windows in locations where windows are exposed to excess sun. Fort Collins Utilities' Water Treatment Facility delivers tap water to the community through a gravity-fed system that flows from the west to the east, with pressure increasing as it flows east through a network of pipes and valves. Water pressure is not regulated and varies according to where you live. Fort Collins Utilities often receives calls from customers living in older homes with questions about low water pressure. Commonly, the cause is identified as low water flows rather than low pressure, which is often the result of aging water service lines in older homes. Low pressure can be caused by high usage in the area (e.g., summer landscape watering) or may indicate a leak in the system. Learn more about water leaks at fcgov.com/high-water-use. Flow decreases also can result from clogged faucet aerators, showerheads or pipes. Replacement or repairs to service lines are the homeowner's responsibility. For more information, contact a licensed plumber. High pressure is regulated on individual properties with a pressure-reducing valve (PRV), owned and maintained by the property owner. Contact your plumber for more information. 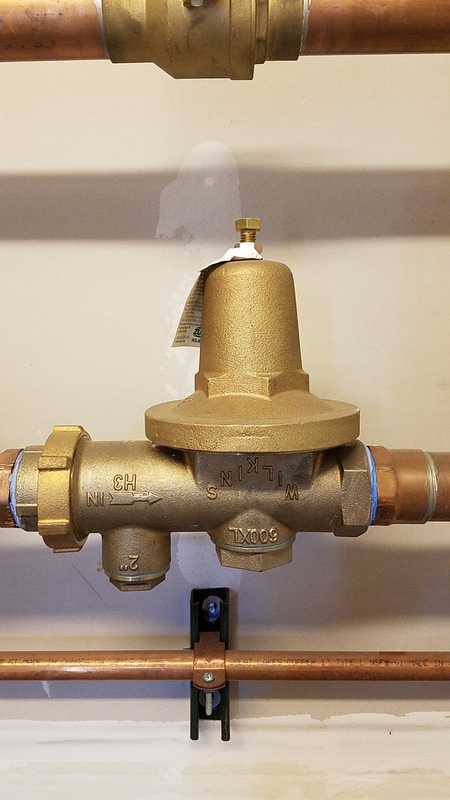 Anytime water pressure is above 80 PSI (pounds per square inch), a pressure-reducing valve (PRV) is required in new construction. PRVs help ensure water isn't rushing into your home too quickly. If too much pressure builds up, it can damage fixtures, faucets and possibly pipes. Pressure regulators reduce the water pressure to below 80 PSI. If you are concerned with high water pressure, check to see if you have a PRV installed. This device can wear out and may need to be replaced. PRVs are sold at retail stores, or contact a plumber to make repairs or install a new device. Replacement or repairs to service lines and PRVs are the homeowner's responsibility. For more information, contact a licensed plumber. If you have further questions about water pressure, call Fort Collins Utilities' Water Department Superintendent at 970-416-2165.